Hon’ble Finance Minister Shri Arun Jaitley introduced the concept of Business Trust by Finance Act, 2014. In India, Business Trust would operate as Real Estate Investment Trusts (REITs) and Infrastructure Investment Trusts (InvITs). Real Estate Investment Trusts (REITS) have been successfully used as instruments for pooling of investment in several countries. REITs were created in the United States in 1960. Since then, many countries around the world have established REIT regimes. The units of which are required to be listed on recognized stock exchange in accordance with the aforesaid regulations. Business Trust= Real Estate Investment Trusts (REITs) + Infrastructure Investment Trusts (InvITs). The income bearing assets would be held by the trust by acquiring controlling or other specific interest in an Indian company (SPV) from the sponsor. The Securities and Exchange Board of India (SEBI) has notified regulations relating to two new categories of investment vehicles namely, the Real Estate Investment Trust (REIT) & Infrastructure Investment Trust (InvIT) on 26th September, 2014. These are SEBI (Real Estate Investment Trusts) Regulations, 2014 and SEBI (Infrastructure Investment Trusts) Regulations, 2014. Real Estate Investment Trust (REIT) is a trust that owns and manages income generating developed properties and offers its unit to public investors. REITs own many types of commercial real estate, ranging from office and apartment buildings to warehouses, hospitals, shopping centers, hotels and even timberlands. Globally, REITs invest primarily in completed, revenue generating real estate assets and distribute major part of the earning among their investors. Typically, most of such investments are in completed properties which provide regular income to the investors from the rentals received from such properties. REITs are principally expected to invest in completed assets. Income would consist of rental income, interest income or capital gains arising from sale of real assets / shares of SPV. REITs are managed by professional managers which usually have diverse skill bases in property development, redevelopment, acquisitions, leasing and management etc. 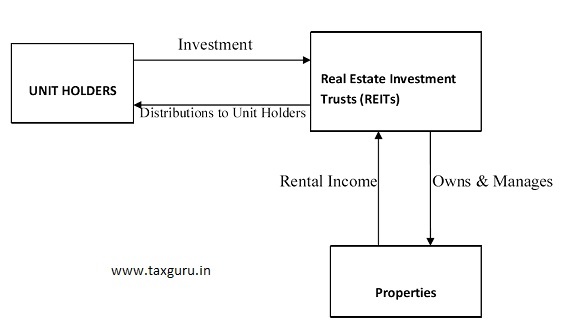 Listed REITs provide liquidity, thus providing easy exit to the investors. Infrastructure Investment Trusts make direct investment in infrastructure facilities which are yielding income e.g. Toll Road, Railways, Inland waterways, Airport, Urban public transport. InvITs will allow infrastructure developers to monetize specific assets, helping them use proceeds for completing projects of theirs stalled for want of funds. Structure of InvITs is quite similar to REITs. The main difference is InvITs make investment into infrastructure facilities whereas REITs make investment in commercial real estate properties. The country’s largest real estate player, DLF and private equity players such as Blackstone have been planning to launch REITs. MAT was one of the biggest hurdles in the way of REITs, now the discussions have again started after the government has relaxed norms on minimum alternate tax. Finance Minister had addressed the issues to simplify REITs taxation regime. In his budget speech of Union Budget 2015-16, Finance Minister has mentioned that these collective investment vehicles (namely REITs and InvITs) have an important role to revive construction activity. A large quantum of funds is locked up in various completed projects which need to be released to facilitate new infrastructure projects to take off. It will be interesting to see in future how India’s real estate sector will be affected by these investment vehicles. Nice one. Can you please help me in finding regulations and procedure for setting up SPV in India? Very well explained the concept in simplified manner. Keep it up.